The Sociology department at UNL was founded in 1889. Faculty and students at the Department of Sociology are leading social science in exciting new directions. Small compared to other Big10 Sociology programs (21 faculty), students engage with research focused on solving real world problems. 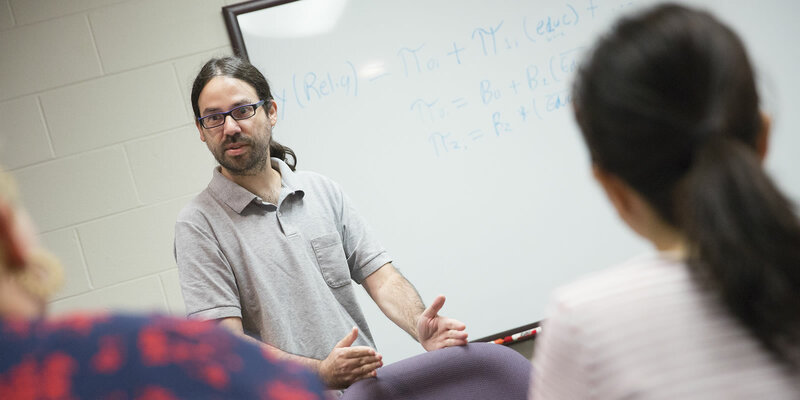 Faculty collaborate with each other and with people across disciplines, including computer science, psychology, anthropology, political science, criminology, biology, neuroscience, medicine, public health, art, marketing, and business. Our faculty also work with community stakeholders and community-based non-profit organizations. These collaborations lead our faculty and students to ask and answer interesting questions. Check out our recent research, including open-access versions of faculty and student publications, to discover how Sociology faculty are tackling issues in rural drug use; HIV infection risks; social networks; homelessness; delinquency; health and well-being through the life course; survey questionnaire design and polling; minority health disparities; science identity; and sexualities and LGBTQ+ rights; among many others. We are committed to equipping undergraduate students with the critical thinking and analytical skills that puts them on the path to meaningful and rewarding careers. Alumni have launched their careers with community organizations such as Voice of Hope, Community Learning Centers, and Teach for America; government agencies like the Department of Agriculture, the state legislature, and law enforcement; and private sector businesses such as HUDL, Talent+, Gallup, NelNet, and insurance companies. Our undergraduate students also go on to law school, medical school and professional programs the health fields, or to complete an MBA or graduate programs in sociology or related disciplines. Our MA and PhD students can specialize in the sociology of health, families, social inequalities, or research methodology, benefiting from a small faculty-to-student ratio. We train graduate students for both traditional academic jobs at colleges and universities, as well as work in the public and private sector. We have a long tradition of training students for successful placements at non-academic positions, including think tanks, research organizations, government agencies, non-profit service organizations, and for-profit organizations. Get up-to-date news from the UNL Sociology Twitter and Facebook accounts. On September 28, 2010, the National Research Council (NRC) released its first review of U.S. graduate programs since 1995. This report provides rankings for many disciplines, including those from 117 Ph.D. programs in the Sociology category.The NRC report provides aggregate ratings for the Ph.D. programs. The 2010 NRC program rankings are reported in terms of 90% confidence ranges. The website PhDs.org uses the rankings distribution data to provide rank-ordering of programs based on centroid scores.